Ice fishing on the frozen sea-ice for two hours including a break with a hot beverage and some sweet bread. Our guide brings all necessary equipment and we use our big snowmobile sled to reach the best locations. We drill our holes in the ice and start fishing for “the big one”. A normal catch would be perch or sometimes pike. 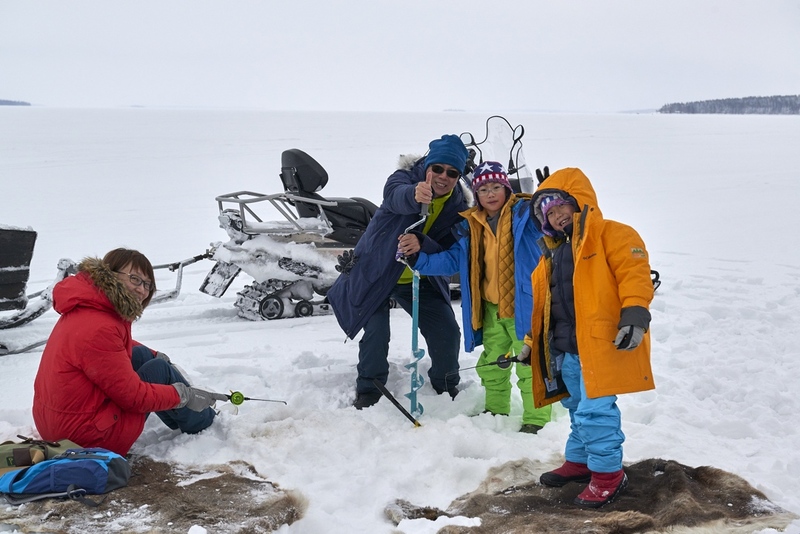 Ice fishing is an easy and fun way to spend time in Luleå beautiful nature. Spend two hours with us as part of a small group of 2-6 people to an ice fishing location on one of our frozen lakes, rivers or even the frozen sea off the coast of Luleå. Starting in the town of Luleå it is a very short drive in our comfortable minibus to a great location. We cant promise you will catch fish of course but we will give you lots of great tips so that you have a good chance. Part of our tour involves an open fire in the nature plus a warm drink and some delicious local cakes. This tour is 2 hours and if the conditions are ideal and you would like to extend the tour this can be arranged with the guide on the day. What’s included? Ice fishing rods, bait, ice drill, transfer to and from your accommodation in Luleå to a fishing location, warm drink and cakes. What do I need to bring? Warm clothing including hat, gloves, warm shoes.